This is the story of the largest and statistically most successful tank destroyer of World War II. The Ferdinand was a true behemoth, and although only 91 examples were built, they took a savage toll of Soviet armour in the Battle of Kursk and subsequent operations on the Eastern Front. 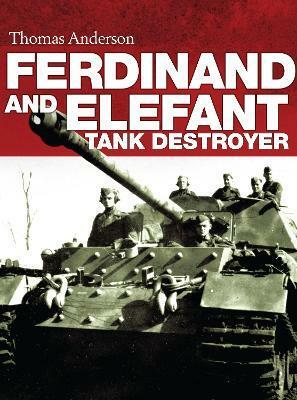 This study explores the technical development and combat deployment of this remarkable vehicle, from its' origins in the Porsche Tiger Tank through its deployment under the designation 'Ferdinand' in the Citadel offensive, to its modification and redesignation as the 'Elefant' and final use in the desperate Battle of Berlin. Drawing on original archival material from within Germany, private collections and heretofore unpublished photographs this title is an essential illustrated history to one of the most famous armoured vehicles ever built. A German national, Thomas Anderson is a specialist in the German Armoured Fighting Vehicle of World War II. He has spent decades trawling the archives throughout Germany and the rest of Europe to discover little known facts and never previously published photographs of the might of the Blitzkrieg. A modeller, he regularly contributes to popular modelling and historical magazines across the globe including Military Modelcraft International (UK), Steel Art (Italy), Historia Militar (Spain) and Batailles & Blindes (France) as well as many others. He has previously published a three-volume history of Sturmartillerie/Sturmgeschutz in German which is due for release in English in the next year.